Great Gemstones. Great Jewelry. Great Stories. is a great featured article in Prism magazine, written by industry expert Marlene Richey! 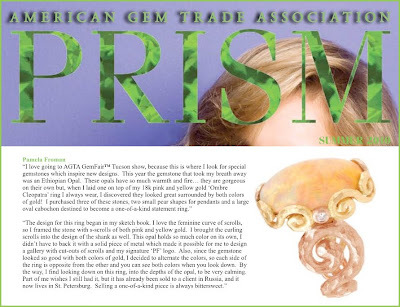 Marlene interviewed Pamela for this a few months ago, wanting to know about her favorite find at the Tucson GemFair this year, and how that gemstone became a piece of Pamela Froman Fine Jewelry. In case you don't get Prism, I've retyped the article below. Read on to learn about Pamela's design process, in the designer's own words. I hope you enjoy Pamela's great story! Great Gemstones. Great Jewelry. Great Stories. For decades the jewelry design world has been dominated by men. But there has been a seismic shift in the landscape by an enormous influx of gifted women jewelry designers who are approaching their craft with professionalism, creativity, business acumen, excellent smithing skills and a new spirit. Walk the aisles of any fine, craft, gift, or fashion jewelry trade show and you will witness these changes for yourself. One of the insights women bring to the table is that women understand designing for women. And since the vast majority of ultimate consumers are women, this change in demographics only makes sense. They instinctually comprehend how earrings should hang, if a ring is comfortable and if a bracelet is "right", because they are designing for themselves. 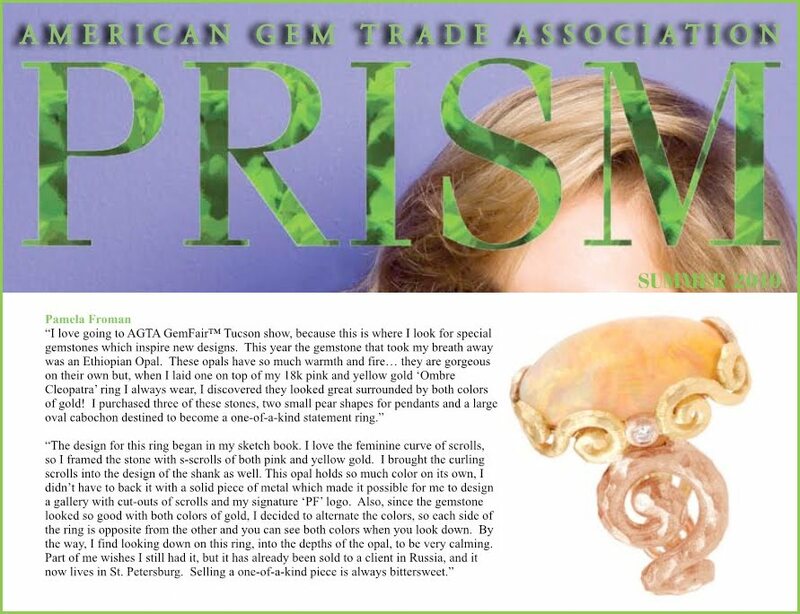 "I love going to the AGTA GemFair Tucson show, because this is where I look for special gemstones which inspire new designs. This year the gemstone that took my breath away was an Ethiopian Opal. These opals have so much warmth and fire... they are gorgeous on their own but, when I laid one on top of my 18k pink & yellow gold 'Ombre Cleopatra' ring I always wear, I discovered they looked great surrounded by both colors of gold! I purchased three of these stones, two small pear shapes for pendants and a large oval cabochon destined to become a one-of-a-kind statement ring." "The design for this ring [shown] began in my sketch book. I love the feminine curve of scrolls, so I framed the stone with s-scrolls of both pink and yellow gold. I brought the curling scrolls into the design of the shank as well. This opal holds so much color on its own, I didn't have to back it with a solid piece of metal, which made it possible for me to design a gallery with cut-outs of scrolls and my signature 'PF' logo. Also, since the gemstone looked so good with both colors of gold, I decided to alternate the colors, so each side of the ring is opposite from the other and you can see both colors when you look down. By the way, I find looking down on this ring, into the depths of the opal, to be very calming. Part of me wishes I still had it, but it has already been sold to a client in Russia, and it now lives in St. Petersburg. Selling a one-of-a-kind piece is always bittersweet."